There are three main reasons people use our "Clever Yoga" Yoga straps. The first is actually for Yogic purposes. If you have trouble holding a yoga pose or have trouble "connecting" the appropriate limbs, our Yoga Strap will aid you greatly. Perfect for your Yoga Starter Sets. The second most common use is just to increase your flexibility. For example, if you currently can't touch your finger to your toes, use our Yoga Strap to bridge the gap. Then over time, you can "walk" your hands closer to your feet until the point you can touch them completely without even using the strap. The third use is probably the most important - for physical rehabilitation. This is why you're seeing yoga straps more and more in Physical Therapy settings. Just be sure to work through your own range of motion and never stretch to the point of pain. 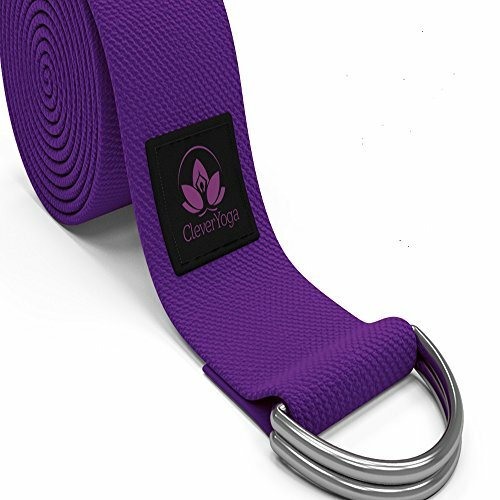 When you order your Clever Yoga "Yoga Strap" today you're protected by our "Namaste" Lifetime guarantee - if you're not 100% satisfied with your Yoga Strap or if it doesn't hold up for you forever, we'll replace it free of charge - no questions asked. So order now!